A saucer-shaped object on a very wide flatbed truck had some people wondering if the government was moving a UFO in or near Washington, D.C., Wednesday night. The truck came south on I-270, then took the inner loop of the Capital Beltway from Montgomery County into Prince George’s County. When motorists snapped photos of the strange object and posted them on Twitter, some people became concerned enough to call local police. One man called 911 in Prince George’s County because, he said, he was concerned about a relative who lived along the route. 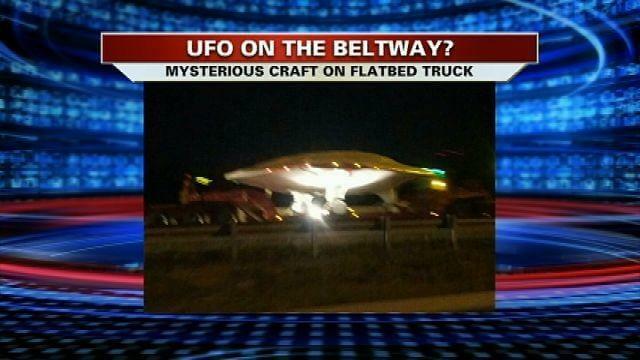 Well, it turns out the mysterious object on the truck cruising around the Beltway is capable of flight. It’s an experimental, unmanned aircraft called an X-47B, according to Northrop Grumman spokesman Brooks McKinney.The company spokesman said the saucer-like shape of the aircraft is a deliberate effort to make it harder to detect. “[It’s] a shape that minimizes its refection of potential … enemy radar signals,” said McKinney, who also pointed out that the aircraft has no tail. The spacy-looking aircraft was being delivered to Patuxent Naval Air Station for testing. The manufacturer hopes that someday the government will purchase many of the drones so they can be stationed aboard U.S. Navy aircraft carriers. McKinney said the remotely-piloted aircraft can be used for surveillance or can be rigged to carry weapons. Two of the experimental aircraft are now in Maryland. Why not fly the drones from their previous base in California? McKinney said the FAA is not currently keen on unmanned transcontinental flights. DC News FOX 5 DC WTTG.